Erik Abel is an artist and designer currently living and working in beautiful Ventura, California. We talked to Eric about his work and inspirations. Warren Keelan has quickly risen to become a mutli-award winning renown water and ocean landscape photographer. This is the eleventh article of the series, and it's about time. Matt Allen is an accomplished artist and Creative Director having worked with Surfer and built up The Ryde clothing company. He is currently a freelance illustrator, creating custom type and illustrations. 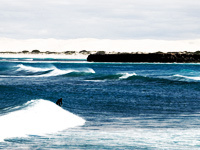 In this tenth article of the series we look corporatisation of the surf industry. A hand picked collection of amazing surf quotes made by famous surfers and ordinary people alike. In this ninth article of the series we look at the birth of the thruster by Simon Anderson and the battle between the Tom's, Carroll and Curren. Wax Surf Co is a Brooklyn based, handmade, custom board company founded by Michael Farley and Tyler Jorgenson. We had a good chat with Tyler on how they came about.